All existing interests must be notified by 31 December 2015. From 1 March 2015, privately-owned foreign investors have already been required to get prior approval for a proposed acquisition of an interest in rural land where the cumulative value of rural land that the foreign person (and any associates) already holds exceeds, or immediately following the proposed acquisition is likely to exceed, $15million. Please click here for online agricultural land register forms. 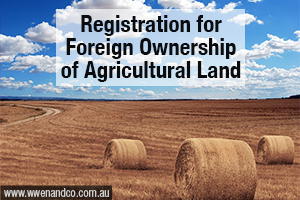 Need help on registration of land as a foreigner? Please call our chartered accountants at our Epping Office for help.